I am at Brussels airport, waiting for my flight back to Rome. After six weeks with the family, we are off on our own again. The kids go off to sports camp, Tine starts working in Belgium and I am off to Italy, back to saving the hungry in the world. 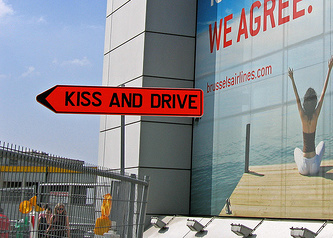 Hey, they have new roadsigns at the airport, saying "Kiss and Drive", meant to guide people to a passenger drop off zone. I am not sure if the combination of kissing and driving is really safe, but I am all for it. However, maybe "Park and Kiss" would have been more appropriate! So far for the smileys. At check-in it seems they have changed the system for self check-in: you will need your reservation number. You can't check in via your name, passport scan (as in Rome), or credit card swipe. No, you need your reservation number. Damned if I would take out my computer, boot it up, and check my email for it. Damned if I would print it out on paper before I come. Thought eTicketing was all about paperless and effortless booking and checking in? Not so with Brussels Airlines, it seems. Nope you need your reservation number, sir!. Ok, so I try to check in at the "Express check-in", thinking "I only have hand luggage, so I guess this is 'express check-in' "? Not so. A young man stopped me asking for my boarding pass. I told him "No, I am checking in, and am following the signs." He said: "No checking in here, you need to follow that line", and pointed to another row of check-in counters. I told him this was confusing. He just shrugged his shoulders and looked the other way, ignoring my comments. He told a colleague who approached me to explain and said: "Ignore him, difficult customer!" So, I am checking in. They ask to weigh my hand luggage, which is a compact trolley with my computer bag in it. In the bag some small chargers, my laptop and a book: 9.6 kg. "Sorry sir, you are only allowed 5 kg handluggage, you will have to check it in", she said. Dah. Checking in a computer bag? To Rome? Rrrrright. *If* it would arrive, i'd have to wait for 90 minutes at the luggage belt. "Nope", I said, "I can show you one kilo of handluggage and then shop and buy 50 kgs of duty free goods, and you would not even know. So..."
She let me go... I *am" a difficult customer! I will most definitely be back! Thanks for the comments, Emmanuel! 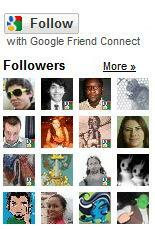 Rumble: Even the daily things can be unusual. Rumble: Africa is THIS big! News: Beauty contest for Italian nuns.